I’m sure most who have been keeping up with the patent disputes between Apple and Samsung will know that over here in the United Kingdom, our courts found Sammy to be innocent of infringing on Apple iPad design with Galaxy Tab slates, and as such Apple was ordered by the court to post an apology to Samsung on their UK website, as well as in the UK press. Well after somewhat dragging their heals over the matter, Apple has finally complied and something that could be construed as an apology to Samsung has now shown up in newspapers in the UK, with an article on Slash Gear reporting that the text was found on the fifth page of the Guardian and was revealed via a tweet by Tim Acheson. However apparently the text did show up in other UK newspapers as well. Apple was recently told off about the statement they posted to their UK website on the matter, and that statement has now been removed, although Apple has yet to update their site with the new statement. 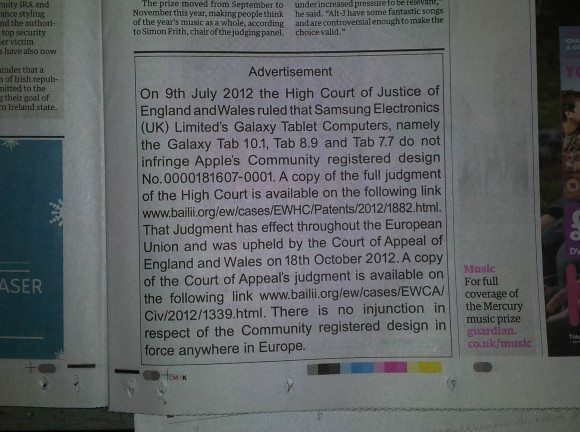 The original statement didn’t go down too well with the UK court, with the statement not just explaining that Samsung didn’t copy the design patents of the Apple iPad, but also included comments from the ruling saying Apple gear is distinctive and cool, along with citing other countries finding that Samsung did copy Apple’s design patents such as Germany and the United States. As such the three UK judges were not too happy with the original statement claiming it was a breach of the order, and Apple’s response that it would take 14-days to amend the statement didn’t go down too well either, and as such Apple has now been told that the amended statement must be placed right on the site’s main page rather than at the bottom of a separate page with a link to the statement. On checking Apple UK, the link to the separate page has now been removed but as yet there is no amended statement showing on the main page. No sincerity,no trustworthy,no humbleness. All that are coming out from Apple is craftiness,arrogancy,dictatorship,exclusivity,greed,blood sucking,deception, etc. All these attitudes are in Apple’s evil DNA. I think whomever loses one of these silly patents suits should have to apologize to the other company and all consumers for effectively making false claims against the other company or co-opting the other companies patented thingy. this is at the bottom of the apple UK site first page…. not exactly what I would call even approaching an apology.